A moisturizing and very gentle cleansing bar. 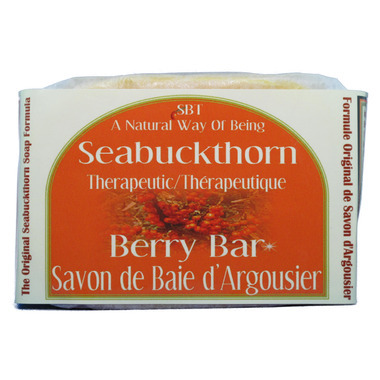 Vegan-friendly ingredients including SBT Seabuckthorn Seed and Fruit Oils (in generous amounts). This proprietary blend is made of all natural and luxurious vegetable oils. It is the company’s most popular cleansing bar, is safe for all skin types and is especially appropriate for people with highly sensitive skin such as those with rosacea. Cocos nucifera (Coconut) Oil, Olea eurpaea (Olive) Oil, Purified Water, Organic Hippophae Rhamnoides (SBT Seabuckthorn) Seed Oil, Organic Hippophae Rhamnoides (SBT Seabuckthorn) Fruit Oil, Ricinus communis (Castor) Oil, and Sodium Hydroxide (Soda) Crystals. Pingback: A Day in the Rosy Life – Living the "Rosy Life"